Sweet Potato Toast is shaking up the world of toast! Move over bread, sweet potatoes are taking over the toast world! Sweet potatoes are incredibly versatile. It’s one of the reasons we love them so much. 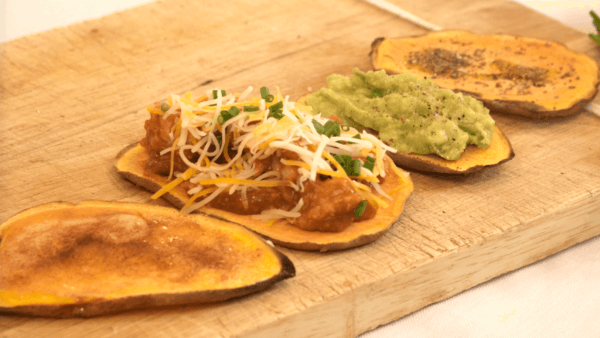 We’ve shown you how to use sweet potatoes as noodles and how to use them to put a fun twist on traditional potato skins. Now we are going to show you how you can use slices of sweet potatoes in place of bread to create toast. Sweet potato toast makes a delicious appetizer, snack, or breakfast. Before we get to the instructions, let’s take a minute to discuss why you may want to incorporate more sweet potatoes into your diet. They have many nutritional benefits. Sweet potatoes are high in Vitamin B6 which helps reduce the non-protein amino acid Homocysteine in our bodies. Homocysteine has been linked to degenerative diseases such as heart attacks. Sweet potatoes are a good source of Vitamin C, which plays an important role in bone development, digestion, and blood cell formation. Vitamin C is also a key contributor to protecting our bodies from toxins. Sweet potatoes are a good Source of Vitamin D which is critical for an efficient immune system and overall health. Vitamin D plays a critical role in our energy levels, moods, and helps build healthy bones, heart, nerves, skin, and teeth. Sweet potatoes contain iron which is critical in red and white blood cell production; magnesium which is a relaxation and anti-stress mineral; and potassium which helps regulate heartbeat and nerve signals. Since sweet potatoes are naturally sweet and they slowly release their sugars into the bloodstream, they don’t cause a spike in blood sugars. This helps keep a balanced level of energy. Sweet potato contains Carotenoids which are powerful antioxidants that help ward off cancer and protect against the effects of aging. Whether you are gluten-free, trying to incorporate more veggies into your diet, or just want a new and delicious recipe to try, sweet potato toast is for you! Watch and see how simple it is to make sweet potato toast. Slice sweet potato lengthwise into 1/4" slices. Place the sweet ptoato slices in a toaster on high. You may need to toast multiple times depending on your toaster. Get creative with your Sweet Potato Toast toppings! Don’t feel locked into the toast toppings shown in the video. These are four of our personal favorites, but we encourage you to get creative and find your own. There are endless topping options. For breakfast, try topping your toast with almond butter and bananas or a fried egg. For an afternoon boost, top your sweet potato toast with tuna or chicken salad. Treat your sweet tooth to a combination of ricotta cheese, berries, and honey. If you are serving sweet potato toast as a party appetizer, make three or four different combinations and watch your guests swoon over each. Serve at least one sweet and one savory option and you’ll make all your party guests happy! Are you excited to give sweet potato toast a try? Which topping sounds best to you or will you try your own? Let us know in the comments below.